I’ve spent the last 4+ years of my life working towards one of those diploma things and now I’m left with mere months until this undergraduate life is all over and done with. Technically my graduation date is in 2016, but technically I’m actually finished with school at the end of 2015. So I’m gonna do like any true senior would and choose the gimmicky one with the smallest amount of effort – here’s a list of 15 things I want to do in Boston before I leave Northeastern! Finally try something from Chicken Lou’s: Famous eatery on campus that I’ve never actually eaten at before, though I could pick out the smell of their fresh fried chicken from 10 miles away. Or at least from Richards Hall. Go to an ImprovBoston show: Improv is one of those things that is either so fun to go to because it’s so good or so fun to go to because it’s so bad. I’m leaning towards checking out a student showcase, but I wouldn’t mind The People’s Show either. Share a meal with Shillman Cat: Did it! First meal back at school consisted of a burrito and a one-sided conversation with NU’s favorite cat statue. Not sure why I wanted to do this, but at least I’ve accomplished something here. Crawl to bars with El Tour: These seem to be a popular activity amongst the young’uns. I guess that makes sense since they started as Northeastern house party crawls. I’d like to go Drink to Fall but I’ll be off adventuring elsewhere so Christmastime Crawl, anyone? 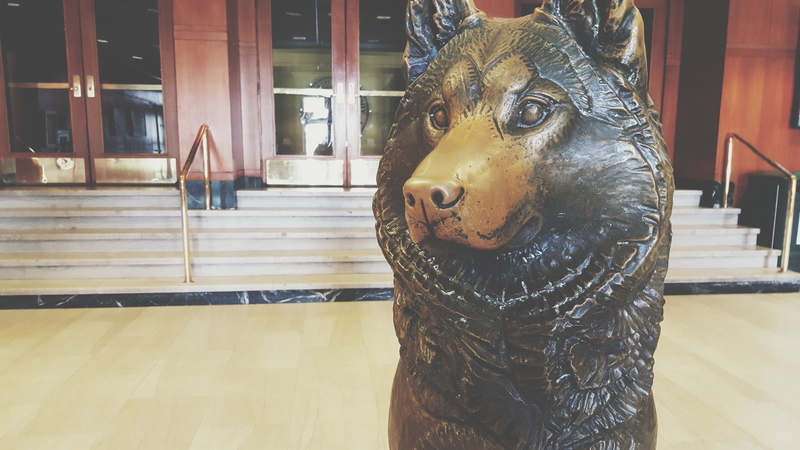 A finals week Nose Rub: Everyone is told about the mystical tradition of rubbing the Ell Hall Husky’s nose for luck before finals week but I’ve never actually done it. I’m asking you all to skip this year cause I’m gonna need to take all the luck I can get on my way out of here. Last Supper in Stetson East: I was able to survive my entire first year of college on little more than chocolate fro-yo with marshmallows and french fries with mashed potatoes. I definitely won’t sob real almost-adult tears upon that revisit. Have a cup of coffee at the end of every Green Line: A lot of students become acquainted with the MBTA and the Green Line is where I’ve spent most of my time over the past few years. I felt I should give it a proper send-off a la riding it all the way to the last stop on each branch for some yummy hot beverages. Sit in on that cool music class: MUSC 1111 is apparently the technical term for it. BUT unfortunately for me, ‘Rock Music’ is not being offered this semester so I’ve gotta go for the next best thing: MUSC 1112 aka ‘Jazz.’ So many people have taken one or the other of these 500-person classes throughout the years and I’ve never had space to be one of the cool kids. So, I decided screw it – I’m gonna crash a lecture anyways. Go to The Sinclair again: My favorite concert venue in Boston (technically Cambridge). I’d love to go boot-stomping and beer-drinking just one more time, especially when they’ve got Wormtown ‘Be Hoppy’ on draught. Point me in the direction of the bluegrass! See a Harvard Football game: I absolutely adore college football, but silly me picked a school without a team. Given that watching a game in person will also be a first for me, I figured what better place to do that than in the oldest collegiate stadium in the country? Tour Jack’s Abbey Brewery: Massachusetts is home to a lot of breweries and I’d like to take advantage of that. Did you know I like beer? Is that evident? Have I mentioned it only 1500 times in the past few posts? Because, I like beer. FINALLY visit the MFA: Now this one is downright unacceptable. Not only have I lived literally right across the street from this place for years, but my school ID gets me in for free! And I’ve never gone! There is a pretty cool looking Herb Ritts exhibit calling my name. Have a people-watching brunch on Newbury: I better hurry up and do this one soon while the weather holds up. Every time I stroll down this famous Boston street, I’m supremely jealous of the friends having brunch and gossiping on outdoor patios. Which of you wants to share a pitcher of bellinis with me one of these Sundays? Attend the Boston Common Tree Lighting: Okay, okay, so I’ve been to this before too… But that was freshman year and its one of my favorite memories! I adored it! Christmas in Boston is one of the most magical things you can experience and I just want to drink some hot cocoa, listen to carols, ring a few bells, and jig my way home down Comm Ave.
Let me tell you, I put very minimal effort into thinking about this list. So if there is something you think I absolutely have to do as a college senior or as a Bostonian then please PLEASE suggest / mention it! Note: stay away from the typical big tourist things. Yes, we’ve all Freedom Trailed our way to the North End after one too many Sam Adams down in Southie on St. Patrick’s Day. I hate cannolis.